Outside of India London and New York are probably my two favourite cities in the world. They're both teeming with art, culture, fashion, food and commerce, all at the same time. 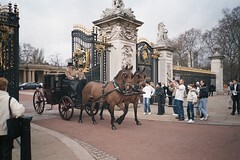 London, more than anywhere else, boasts a mélange of peoples from around the world. Primarily Europeans, but quite a sizeable population of North African, Middle Eastern, Australian and East and South East Asian peoples. For a student of languages, I can't think of any place tastier. The best way to get around a city like this is to get lost. Get lost intentionally as many times as you can. This isn't a largely planned city. It's an old city that's been rebuilt once, and the large number of lanes and alleys can find interesting squares. I'm a little partial towards the West End because that's the liveliest part of town. 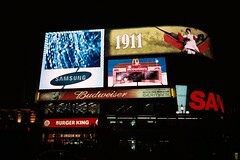 The areas around Picadilly Circus, Leicester Square, Oxford Street and Bond Street have the biggest department stores, theatres and restaurants. Then there's the uptown residential areas of Hyde Park and Notting Hill, with a few expensive restaurants and pubs. You'd need quite a bit of time to take it all in. Local Londoners are a busy bunch. Always hurried, almost running. Perhaps it's because they always need to get somewhere, or perhaps it's to counter the cold. The thing that I've learnt is to not bother keeping pace with the crowd. Let them move on, just feel the whoosh as they go by. Taking off from Mumbai and landing in London during the day is a strange experience. From the air, the roads and traffic look almost the same. Red buses, driving on the left, and traffic buoys. One can see immediately where Mumbai's architectural influence came from. I've visited the UK a few times, three of them as an adult, and London's been on the cards on every occasion. I've been here at all times of the year, and I can't say that the weather changes much. It's sunny when it's sunny and it's rainy when it's rainy... and often it's both at the same time. For someone from the tropics, it's cold throughout the year, but in winter it's freezing. Getting around is fairly easy. The tube will get you anywhere, and a day pass is valid on any train and bus throughout the day. There are travel zones from 1 to 6 depending on where you need to go and can get you all the way from Heathrow airport to the centre of town... which is a very convenient way to get from the airport to any place you need to get to — if you don't have too much luggage. There are innumerable tourist booklets with lists of sights and places to see. 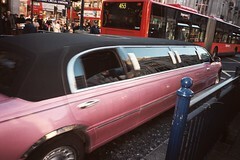 What I recommend is to take one of those tourist buses that get you all around London in a day. For a little extra they throw in a boat ride down the Thames. I started out at Baker Street - the home of Sherlock Holmes. Walk down to the Sherlock Holmes museum, and then the Beatles museum. Get done with Madame Tussade's and the Planetarium. You may want to get a combined ticket and go into the Planetarium first. You'll avoid the long line for the wax museum. Then get onto a bus and take the tour. Get off anywhere and roam around. The London Dungeon, Tower and Tower Bridge are all near each other, and a night walk by the Thames, and across London Bridge is lovely, especially if you have the right company. 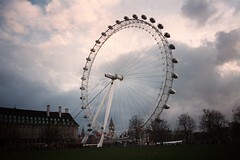 The London eye offers a complete view of the city, but it doesn't compare to actually being there. 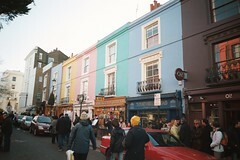 Walk around Hyde Park, and visit Portobello Road at Notting Hill for the antique market every Saturday. You might just find an interesting bargain. 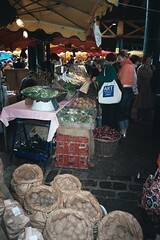 If farmer's markets are your thing, head down to the Borough market at London Bridge, also on Saturdays. Try the Ostrich or Kangaroo burgers. They're delicious. If you already have your route planned, and have done some research on spots of interest, it may be cheaper to just get a Zone 4 or 5 travel card and take the red buses around. Traditional tourist locations include Westminster, Trafalgar Square, St. James' Park, Buckingham Palace and St. Paul's Cathedral, but be a little adventurous. Walk around and find places. Take the tube down to Greenwich and have a look at Cutty Sark. Search for the prime meridien. Look for pubs with interesting names like The Pig's head or Trotting Horse. Step into the Roundabout and watch a local game of football or cricket. Walk down to the West side and go to the theatre, then stray into China Town and take in the aroma. Be part of life here, because there's a lot of it around. There's much to choose from for the seasoned gourmand. Take your pick from Italian, French, Belgian, North African, Japanese, Chinese, Indian, Thai, Malaysian, Caribbean, German, and whatever else you can find. There are restaurants everywhere serving every cuisine, and where there aren't, you'll find a host of pubs. Just explore. Fashion. London is one of the big four cities for fashion, and heck there's a lot of it here. On the streets, in the department stores, in restaurants, in night clubs. Everywhere. I'm not an authority on fashion, heck, I don't have any dress sense, but fashion is hard to miss in London. If shopping's your thing, you won't be displeased. Go all out. Whether its food, finance or fashion, art, history or language, music, movies or haberdashery, London has it all. 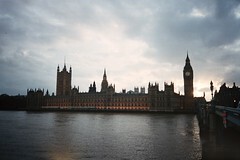 Visit London, and visit often.